We’d love your help. 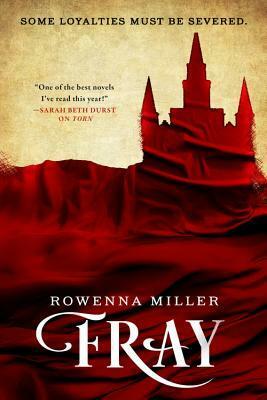 Let us know what’s wrong with this preview of Fray by Rowenna Miller. In this epic sequel to Torn, the magical seamstress Sophie Balstrade navigates a royal court and foreign alliances fraught with danger -- and may well have to risk everything for love and for country. Open revolt has been thwarted -- for now -- but unrest still simmers in the kingdom of Galitha. Sophie, despite having built a thriving business on her skill at both dressmaki In this epic sequel to Torn, the magical seamstress Sophie Balstrade navigates a royal court and foreign alliances fraught with danger -- and may well have to risk everything for love and for country. Open revolt has been thwarted -- for now -- but unrest still simmers in the kingdom of Galitha. Sophie, despite having built a thriving business on her skill at both dressmaking and magic, has not escaped unscathed from her misadventures in the workers' rebellion. Her dangerous foray into curse casting has rendered her powers unpredictable, and her increasingly visible romantic entanglement with the Crown Prince makes her a convenient target for threatened nobles and malcontented commoners alike. With domestic political reform and international alliances -- and her own life -- at stake, Sophie must discern friend from foe... before her magic grows too dark for her to wield. Rowenna Miller's enchanting fantasy series, the Unraveled Kingdom, is perfect for fans of The Queen of the Tearling and Red Queen. To ask other readers questions about Fray, please sign up.